Quiz: What market are you? Max Loeb of White Plains, with his bag of groceries from Trader Joe’s in Hartsdale. Photo by Tania Savayan/lohud. A&P’s bankruptcy made it clear. lohud’s readers are passionate about buying food. The closure of a major chain like A&P affected our community — and groceries, without doubt, are a cultural touchstone here in the Lower Hudson Valley. Indeed, the landscape of food shopping here is a complex one. There are major chains like Stop&Shop, local chains such as DeCicco’s, big-box discount stores, ethnic markets large and small, and corner stores. With this project, lohud’s team set out to explain and demystify the industry, design, past, present and future of how we feed our families. Find a simple guide to “Groceries.” stories below. What to do about the grocery buzz? That was the question on the table this fall as lohud editors and reporters gathered to discuss the coverage of A&P’s bankruptcy and its aftermath. Stories on the chain’s disruptive exit from the market consistently topped the digital metrics we use to track performance on lohud. Clearly, our community was gripped by the story. Not only was traffic up significantly on our website and on our mobile products, but the A&P saga also was selling newspapers, generating letters to the editor and social media chatter, and bringing in tips from sources. Only minutes into our discussion we began trading stories about where we shop, how we shop, when we shop, what we buy, what we love and what we wish were different about the local grocery experience. Based on our own energy and strong opinions, we suspected there was more to tell than a good business story. We sent reporters Hoa Nguyen and Peter D. Kramer and photographer Tania Savayan into the community to listen. For two months, they followed the story, interviewing more than 100 people: shoppers and supermarket analysts, store owners and deli guys. “Groceries.” is a special report on the shifting supermarket landscape in the wake of the A&P bankruptcy, a deep dive into the emotions, strategies and opinions our neighbors associate with that trip to the market. Newlyweds Taylor and Anthony Aloi of Nanuet shop at the Fairway Market there. Photo by Peter Carr/lohud. The supermarket industry is already being drawn and quartered, and when A&P went defunct earlier this year competitors bickered and bargained over the properties left behind by one of the nation’s oldest supermarket chains. Fueled in part by the sale, at unheard-of low rents, of some of the nation’s most sought-after A&P stores, the grocery landscape in the Lower Hudson Valley looks different only a few months later. The local transformation comes just as the grocery industry nationwide is in the midst of a seismic shift in how people shop, what they buy, who competes for the business and even the definition of a supermarket. A&P’s bankruptcy triggered a feeding frenzy over every coveted square foot, the likes of which supermarkets had not seen since the financial crisis of 2008. Supermarket competitors and real estate professionals, who last had the opportunity to expand into new locations seven years ago, were more than eager to review lease terms for some of the A&P locations. Haverstraw is a “supermarket desert” in the eyes of the U.S. Department of Agriculture, but Rockland County nutritionist Michelle Kleinman sees the village more as a food swamp teeming with unhealthy temptations. The village is one of several so-called supermarket deserts in the Lower Hudson Valley, low-income neighborhoods where most residents live a mile or more from the nearest supermarket. Using grocery industry and Census data from 2010, the USDA also identified Spring Valley, Monsey, Patterson and parts of Yorktown as supermarket deserts. Jose Guillen, 25, has worked at C-Town Supermarket in Tarrytown for three years. Photo by Tania Savyan/lohud. Operators of the Evergreen Kosher supermarket could sense an opportunity in Monsey a few years ago as they prepared to open in a space previously occupied by Pathmark. The fact that the market would sell kosher food wasn’t particularly unique. There were other kosher markets nearby. But the stores seemed outdated and weren’t keeping up with the demands of the modern kosher shopper, said A.J. Jordan, Evergeen’s chief marketing officer. “With the Jewish community growing, I don’t know if it was effectively servicing the community,” he said. So Evergreen, which has a motto of “Shop Happy,” set out to be different. It not only offered a wide variety of products and amenities, such as a bake shop, personalized butcher and an extra-large section of prepared and ready-to-cook foods, it did so inside a sleek, 30,000-square-foot, modern store. Michael Powell has a simple rule: Every store needs a story. Powell works at the Los Angeles-based research and design firm Shook Kelley, helping markets sharpen their skills and define themselves: to tell their story. Chestnut Ridge’s Cathy Murphy thought she was in her supermarket, but she was wrong. What was going on was that Murphy’s A&P, just across the New Jersey line in Woodcliff Lake, had become an Acme supermarket last month without her noticing. And Acme doesn’t use self-checkout aisles. Gone was her A&P’s growing selection of organic food to which Murphy had become accustomed, in aisles she had navigated for nearly a decade. Things weren’t where they used to be. What is going on across the Lower Hudson Valley is a dizzying and seismic shift in the local supermarket landscape, as dozens of bankrupt A&P stores have changed hands seemingly overnight to become Key Foods or Acmes or, in at least one high-profile case in Yonkers, a grocery-selling CVS. These changes are more than real-estate transactions. They bring to light the primal and personal relationship shoppers have with their supermarkets. lohud wants to know what kind of shopper you are! Share your results in the comments below, and be sure to invite your friends to take the quiz, too. Mention their name in the right company and you’ll trigger wistful, faraway looks or breathless salivation: Wegmans and Trader Joe’s. Meanwhile, Trader Joe’s inspires people to drive long distances to stock up on supplies of frozen and packaged goods. While Wegmans stores are huge and Trader Joe’s are deliberately smaller, both supermarket chains have avid, some might say rabid, fan bases who crave a store in their neighborhood. Why is milk in the back? 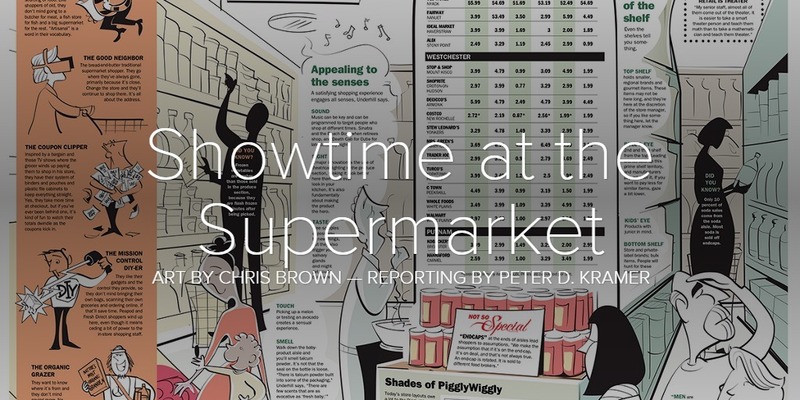 Click on the window above for an infographic demystifying supermarket design. From the edge of the parking lot all the way to the dairy section in the far corner of the store, Paco Underhill explains that science, psychology and economics are at work in our grocery stores. As you stroll your supermarket’s prepared-food section, where you’ll find dozens of hot offerings ready to take home, tip your hat to the humble rotisserie chicken — and Blockbuster Video. Rotisserie chicken was relatively big in the 1950s and into the ’60s in mom-and-pop delis and with home chefs, said Tom Super of the National Chicken Council. What’s next for local markets? It used to be you knew who your competition was. “We have gone from 20th century wars where Gimbel’s fought with Macy’s and Coke fought with Pepsi to what is a 21st-century bar fight where everybody’s fighting with everybody else,” says supermarket expert Paco Underhill. Nowhere is the competition fiercer than it is over the spending habits of millennials, and supermarkets are paying attention, and are prepared to make some changes. Whole Foods, the store famous for fresh food and sticker shock, recognized that it was pricing itself out of a key segment of shoppers. In May, the chain announced it will create “new hip-cool technology oriented” stores geared to 18- to 34-year-olds. A shopper looks over the items in the bakery section at DeCicco’s Family Market in New City. Photo by Tania Savayan/lohud. We’ve all got that special product for which we will take a special trip to a specific store. I took to Facebook and asked for yours. Turns out, lots of people have a food fetish. The photojournalists of lohud took hundreds of supermarket photos for the grocery project. Here’s a collection. Dawna Dennis knows who she is. She’s a 39-year-old married mother of three girls. They have a dog. What they don’t have, yet, is one steady grocery store they can call their own. The family moved to Yorktown from Seattle in August but they’ve yet to settle on the store that gives them everything they’re looking for. Ossining resident Ed Malsberg, 96, no longer drives, but he loves to take the van to the ShopRite in Croton-on-Hudson each week. Tania Savayan reports. In advance of lohud’s special report, Groceries., our editors posted these videos to Facebook to see what shoppers thought of the grocery landscape in the Lower Hudson Valley. The videos were released daily leading up to the project, and built anticipation on social media and among our lohud readers. The new DeCicco’s & Sons in Larchmont will open Dec. 18. Photo by Tania Savayan/lohud. Talk shop — grocery shops — with Hoa and Pete, when they will host a live blog from 6 to 8 p.m. Tuesday, Dec. 22, in the gastropub at the brand-new DeCicco & Sons market in Larchmont. Attend in person or participate in the conversation on this post. As the lohud team conducted more than 75 interviews, they had the chance to gather audio of several of our experts. Take a listen. Hoa Nguyen has reported on A&P’s bankruptcy starting from when company lawyers opened their case in White Plains on July 19, 2015. A 15-year news veteran, Nguyen has covered businesses, breaking news, crime, schools and government in three states. She has been part of lohud/The Journal News’ data journalism and reporting staff for nearly five years. Grocery shopping is one of her pastimes. In more than 75 interviews over the past two months, Peter D. Kramer has learned a bit about supermarkets: how they’re designed, and, most important, the key role they play in their customers’ lives. A 27-year Journal News staffer, his first grocery experience was the Waldbaum’s on Route 303 in Tappan. Now, he’s a Jersey father of four who loves the freedom and speed of technology that lets him scan his entire order as he shop. He keeps his reusable shopping bags in his car, just in case his wife calls and there’s a stop to make on the way home from work. Tania Savayan has been a visual journalist for lohud/The Journal News since 2007. Since A&P filed for bankruptcy, she has interviewed 100 shoppers, about half of which are featured in the many videos she produced for this project. Talking to people and chronicling their grocery habits were among the reasons she enjoyed this project. Plus, it gave her an excuse to go shopping.